Whether you manage pay-per-click advertising campaigns with fixed or flexible budgets, at some point you will likely deliver a PPC budget recommendation suggesting the client increase their digital ad spend. If you have the power to raise budgets so long as you maintain a certain return (ROI, ROAS, etc. ), this conversation may be an easy one if campaigns are exceeding your goals. But for PPC marketers that manage agreed upon fixed budgets (especially those with limited/incomplete tracking), this discussion is often much more difficult. Being prepared with data, a strong understanding of your client's motivations and goals, and a sincere desire to help your client’s business grow can help you navigate this tricky conversation. Read on for common objections to increasing PPC spend and ways to handle them in a manner that builds trust and leads to improved results for your clients. Client Says: You’re recommending we spend more on PPC so you can make more money off of us. Also disguised as, "What data supports this recommendation? You just made these numbers up!" Why? This statement is most often heard by agencies that manage clients on a percentage of spend management fee model. As the client increases PPC spend, the revenue to the managing agency increases as well. This can be a major point of contention. 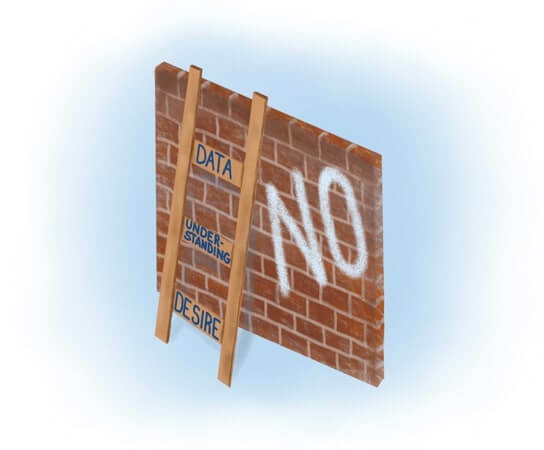 How to Overcome: Overcoming this objection requires: trust between the agency and the client; data-backed budget recommendations; and (if possible) a history of high-quality results. Trust, like historical results, can only be built over time and with proper customer relationship and performance management. Luckily, it’s possible to create a budget recommendation that uses performance data to support your request for more advertising dollars. There are many methods to making good budget recommendations, but we’ll outline the process we’ve seen success with below. - Are campaigns constantly hitting the daily spend/shared budget limit? - Wasted spend, do certain campaigns drive irrelevant visitors or leads? Over a set period of time, we evaluate campaign spend, impression share lost due to budget, daily budget, and days paused to calculate a campaign's maximum potential spend. For example, if an advertiser has a campaign that spends $10 a day average (with an impression share lost due to budget of 0%), the advertiser cannot set a daily budget of $40 and expect the campaign to hit the full budget. But, if they have $50 daily spend, and an impressions share lost due to budget is 80%, the spend potential is calculated as $250. We then analyze the potential spend over the total number of days in the budget cycle to create an estimate of the potential spend a client can achieve. It’s important to note that if keywords, audiences, targeting, or daily budgets were changed mid budget-cycle; campaigns were paused for full days; or seasonality dramatically affects your market, these factors may impact your the accuracy of your budget forecast. Similarly, you may want to also eliminate or alter spend allocations to underperforming campaigns that are failing to achieve your performance goals. Shape built this logic into our own budget recommendation engine called BudgetPacer. BudgetPacer cycles through the analysis above daily (rather than across a period of time) for both Google and Bing, to provide automated, data-driven budget recommendations. Client Says: You’re insane to ask for a 30% PPC budget increase. We won’t go over 10%! Why? No matter what you do, it will be difficult to convince a client to increase spend if they have already predetermined the amount of additional PPC budget they are willing to commit. These clients may be beholden to investor expectations, industry pressures, or antiquated advertising budgets limits that make arguing for the right increase in spend difficult. While this argument is possible to overcome, it will take data and time to convince your client that a bigger budget increase is necessary. As with the first objection, it’s important to help the client understand their maximum potential advertising spend. This helps the client understand what the possible percentage growth looks like over their previous budget even if they don’t implement it. This won’t convince the client alone. In fact, expect the client to push back. The client will be hesitant to believe they can achieve the same return for their advertising budget at 30% spend growth as they have at 5% or 10% growth. One way to overcome this fear is to help the client better visualize their own past performance gains when spend was increased. But overwhelming the client with a data dump won’t work. Use visuals (graphs/charts) to show how additional spend helped improve metrics tied to the client's goals and (if possible) sales. If you don’t have usable conversion data for the client, see if your company has any case studies that correlate improved results to increased ad budgets in markets similar to your client's. Industry trend reports may also be helpful to show a client how their performance metrics and advertising costs are trending compared to their competition, the industry, and inflation. We suggest contacting your advertising platform representatives or utilizing industry reports to help support your recommendations. If all else fails, try to compromise. First, get your client to agree to increase budgets by the amount they have predetermined. Then, ask the client if they’d be willing to test increasing the budget above that amount once you achieve certain performance benchmarks. The client may miss out on their full traffic and conversion potential with this method in the short run, but it can ease them into increasing budgets higher than the original recommendation over time. Client Says: I’m not seeing any results from our PPC campaigns. Traditional advertising works better. What? There are two big reasons clients use this argument. 1) The client’s tracking is horrendous and you can’t prove your efforts are providing value 2) The client is right and PPC doesn’t work for them as well as other channels. How to Overcome: Ensuring tracking is set up properly is fundamental to helping you sell the value of your services properly. If your clients don’t have the ability to collect, measure, and attribute traffic and conversion actions correctly, you’ll never be able to communicate the full value of PPC to them. Unlike most traditional media (which relies on imprecise success metrics such as viewership or exposure), digital advertising offers measurable, granular performance metrics. If you don’t confirm tracking is set up as part of your PPC services, start immediately. Understand what your clients consider value-driving actions (may include signups, calls, downloads, etc.) and ensure these conversions are tracked appropriately. Once you’re correctly measuring the success metrics that directly align with the client’s goals, budget conversations become easier. If your client still feels that traditional channels are driving better results based on their goals, sit down together and evaluate metrics. You may very well find a mailer or a radio commercial works better in the client's market. But more likely, you’ll be able to show how you can tie your campaigns to conversions and sales while the client struggles to associate viewership/listenership with direct sales numbers. This is not to say that you shouldn’t be prepared for the client to be right. PPC may not work well for them. In my previous PPC manager role, I had tough conversations with clients where I had to explain that PPC wasn’t the right marketing channel to help them achieve their goals. Did I exhaust every strategy under the sun I thought prudent? Absolutely. Did their market and product support the growth they were looking to achieve? Unfortunately no. PPC isn’t always a silver bullet and is best used as part of a larger marketing plan. Fortunately, my clients appreciated that I didn’t just recommend an increase to grow our company's revenue. In the long run, we strengthened the relationships with our clients and found alternative ways to meet their goals. Client Says: Send more traffic with the PPC budget you have. Why? Most PPC marketers worth their salt have likely heard this at least once. Exceeding client performance expectations should be the goal of every PPC marketer. And clients shouldn’t be blamed for seeing their PPC team as superheroes when they achieve month-after-month of improved performance, engagement, and conversion metrics. So why would a client devote more money to PPC when their analyst has been doing an incredible job with the budget they have? How to Overcome: It can be hard for a client to understand, but eventually even the best PPC marketer will hit a ‘optimization wall’ on an account with a limited budget. Short of a major advertising platform algorithm change, no combination of multivariate ad or landing page testing, keyword bid changes, extension updates, or targeting tweaks can eek out another 1% improvement in conversion rate. First, regardless if you report monthly, weekly, or ad hoc, be sure to note the optimizations you're making to your client’s account, the results you are achieving, and your recommendations. Every time. It will feel repetitive to you and the client. But, if you’re showing that despite regular, frequent optimization that metrics won’t budge, it’s harder for your client to blame their stagnant results on your lack of action. If the possibility exists for the client to spend more, have a direct conversation with the client. Show the client how X% budget increase could translate into Y% increase in leads and sales. It’s important to clarify that current metrics may not hold steady and that you will face the law of diminishing return at some point. But, helping the client quantify the possible return from increasing their budgets may help them be more amenable to increasing spend. Finally, another more risky option is to play to your client’s ego. Competitive analysis can be a helpful tool to show your clients where their competitors are out-strategizing them. Your client may be willing to devote a few more advertising dollars to test new audience or keyword targeting if they see their competitors implementing and (seemingly) benefiting from these new tactics. Watch out though, as this can cause unreasonable expectations from your clients. With their increased spend, they might expect that they will always outperform their competitors moving forward or that you can magically tell them their competitors' strategies and metrics. It can be nerve-racking to ask a client for additional PPC budget. While you should expect and be prepared to handle objections, take this as an opportunity to grow your client’s trust by showing you are a great steward of their advertising dollars. Are there any other common objections to budget recommendations you hear regularly from clients? We’d love to know how you overcame those objections!